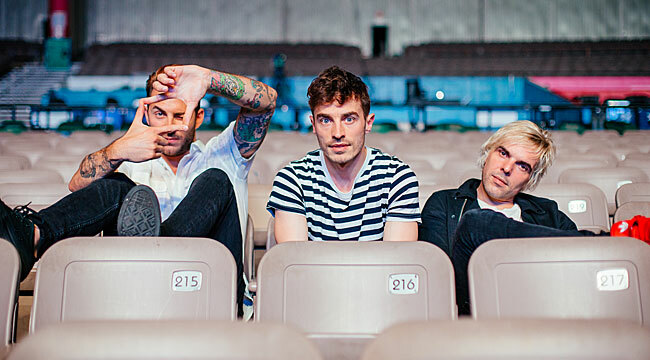 Touring in support of their new single, “Everywhere I Go (Kings and Queens),” Brooklyn-based New Politics draws from the pop/rock/punk approach of alternative rock acts such as Weezer and Nirvana. The band has toured with Fall Out Boy, Paramore, Jane’s Addiction, 30 Seconds to Mars and P!nk but is now on a headlining jaunt and has an album due out in early 2015. Singer David Boyd spoke to us from a Kansas City tour stop. The band formed back in 2009. How did the group come together? We formed in Copenhagen, Denmark where [guitarist] Soren [Hansen) and I are from. We had met two years before that. We were writing songs just for the love of writing and music. We had all these songs lying around. I remember listening to them one night, thinking, “We’re a band and we didn’t even know it.” We won a competition and then everyone was calling and trying to sign us. We had so many options. The American labels started calling after we released “Yeah Yeah Yeah” on YouTube. It was just a one take of us in the basement. We flew to America and RCA wanted to sign us and we packed our bags four years ago and moved to Brooklyn. We met Louis [Vecchio], our drummer, about a year-and-a-half ago. Now we’re on tour getting ready to drop our third album. It’s been an incredible journey. Talk about your approach on your 2010 debut, New Politics. I think that first album reflects a period in our life when we were maybe a little bit angry. There was a bit of angst because we were mad that we weren’t out there doing what we wanted to do and things weren’t going our way. The economy collapsed and we were at war in the Middle East. Something wasn’t quite right. That played a big role with the lyrics. We love all types of music, but we have a hard-on for grunge and rock music. I mean, we are a couple of white kids in the end. We love the Beastie Boys and Rage Against the Machine. It sounds like Weezer and/or Nirvana might have had an influence. Is that the case? Oh absolutely. A good song is a good song. It doesn’t matter if it’s pop or if it’s in another language. 2013’s A Bad Girl in Harlem was a shift in direction, no? I think it is our most mentally challenging album so far. We came to America with these high hopes with a massive label believing in us and great management. We were on the road for a year-and-a-half promoting this thing but it didn’t pay off like we thought. We felt a little bit like failures. We go into the second album and the first mental challenge was that were sort of writing the same album. We wrote like 80 songs and it wasn’t changing. When we listened to the songs, they didn’t sound like us. We did some reflecting. We’re in New York and no longer with a family and friends. Everything was changing. The food was different. The water was different. The way you approached women and socialized was different. We were adapting. The wave of culture shock interfered with the way we thought of ourselves. We were living on Ramen noodles and white bread. We broke down to rock bottom and the songs started coming. They’re just honest songs. It just became us writing. We started to fall in love with where we were even though we didn’t fully understand it. Eventually, we accepted it and made the best of it. We wrote about 15 songs in two weeks. In those two weeks, we wrote “Harlem” and the label loved it. Two weeks later, we dropped it as a single and it became our biggest single yet. How did you get into songwriting to start? Music has always been m life. I started as a dancer in my teens. I learned about music through my dancing. I toured with other bands and met musicians. I had a natural interest in it. I met Søren, who has been doing music all his life. He’s like a jack of all trades. We have an amazing chemistry for writing music together. You’ve been the opening act on several huge tours. Which of them was the most fun? They all have their qualities. One thing that is a common thing with these artists, especially with the big ones, is how it’s so inspiring to see. It takes so much hard work, especially in this day an age when there isn’t a lot of money in music. You know out of your small career what you’ve gone through. The person you’re opening for has a career of ten years and gone through what you’ve gone through tenfold. There’s a reason why they’re selling out arenas—perseverance and drive keeps them going. That is the most inspiring thing to see. It keeps you humble seeing the fans. You write these songs and people just take them. I think music is like an earthly thing that helps you through life. It can trigger your emotions, memory and imagination. We create this music and our fans get touched by it. I’m one of those fans. I know exactly what they’re going through. The trailer for the current tour makes it look like a real blast. This is our biggest dream. It’s what all that hard work and the rollercoaster is all about. That’s the biggest payoff — seeing it grow. All these kids are coming out and took the time to buy a ticket and change their schedule and they’re there singing along at the top of their lungs. That’s the ultimate payoff. What can you tell me about the forthcoming album? We hope to release it in February. We wrote most of it on the tour with Fall Out Boy and Paramore. We had a bunch of new ideas. We wrote non-stop for six months. We sent it to our manager. He liked it. We flew out during the tour and recorded “Everywhere I Go. (Kings and Queens).” And we’re set now. It’s very exciting. We’re on a cloud. “Everywhere I Go” is really rowdy rock song. Playing it live has been so much fun. I think we really bridged the gap between the first and second album. It’s a nice mix of the two.